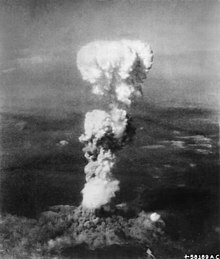 The mushroom cloud produced by the atomic bombing of the city of Hiroshima during World War II. The bombing was an act of total war. Total war is warfare that includes any and all civilian-associated resources and infrastructure as legitimate military targets, mobilizes all of the resources of society to fight the war, and gives priority to warfare over non-combatant needs. The Oxford Living Dictionaries defines "total war" as "A war that is unrestricted in terms of the weapons used, the territory or combatants involved, or the objectives pursued, especially one in which the laws of war are disregarded." In the mid-19th century, scholars identified "total war" as a separate class of warfare. In a total war, to an extent inapplicable in less total conflicts, the differentiation between combatants and non-combatants diminishes, sometimes even vanishing entirely, due to the capacity of opposing sides to consider nearly every human resource, even that of non-combatants, to be a part of the war effort. The phrase "total war" can be traced back to the 1935 publication of German general Erich Ludendorff's World War I memoir, Der totale Krieg ("The total war"). Some authors extend the concept back as far as classic work of Carl von Clausewitz, On War, as "absoluter Krieg" (absolute war); however, others interpret the relevant passages differently. Total war also describes the French "guerre à outrance" during the Franco-Prussian War. In his December 24, 1864 letter to his Chief of Staff during the American Civil War, Union general Henry Halleck wrote the Union was "not only fighting hostile armies, but a hostile people, and must make old and young, rich and poor, feel the hard hand of war, as well as their organized armies," defending Sherman's March to the Sea, the operation that inflicted widespread destruction of infrastructure in Georgia. In The American Revolution, also known as the American Revolutionary War, many basic tactics of total war, such as the Scorched earth policy, were created in a modern form. In 1779, The Sullivan Expedition began, marching through Western Pennsylvania and up through New York, burning Iroquois villages to the ground, leaving nothing behind but smoldering ruin and dead animals. The goal was to force the Indians to go to Canada for food and thus be out of range of attacking American settlements. Almost the whole of Europe and the European colonial empires mobilized to wage World War I. Rationing occurred on the home fronts. Bulgaria went so far as to mobilize a quarter of its population or 800,000 people, a greater share of its population than any other country during the war. One of the features of total war in Britain was the use of government propaganda posters to divert all attention to the war on the home front. Posters were used to influence public opinion about what to eat and what occupations to take, and to change the attitude of support towards the war effort. Even the Music Hall was used as propaganda, with propaganda songs aimed at recruitment. Founding ceremony of the Hakkō ichiu Monument, promoting the unification of "the 8 corners of the world under one roof"
During the first part of the Shōwa era, the government of Imperial Japan launched a string of policies to promote a total war effort against China and occidental powers and increase industrial production. Among these were the National Spiritual Mobilization Movement and the Imperial Rule Assistance Association. The Eastern Front of the European Theatre of World War II encompassed the conflict in central and eastern Europe from June 22, 1941 to May 9, 1945. It was the largest theatre of war in history in terms of numbers of soldiers, equipment and casualties and was notorious for its unprecedented ferocity, destruction, and immense loss of life (see World War II casualties). The fighting involved millions of German, Hungarian, Romanian and Soviet troops along a broad front hundreds of kilometres long. It was by far the deadliest single theatre of World War II. Scholars now believe that at most 27 million Soviet citizens died during the war, including at least 8.7 million soldiers who fell in battle against Hitler's armies or died in POW camps. Millions of civilians died from starvation, exposure, atrocities, and massacres. The Axis lost over 5 million soldiers in the east as well as many thousands of civilians. During the Battle of Stalingrad, newly built T-34 tanks were driven—unpainted because of a paint shortage—from the factory floor straight to the front. This came to symbolise the USSR's commitment to the World War II and demonstrated the government's total war policy. During the Yugoslav Wars, NATO conducted strikes against the electrical grid in enemy territory using graphite bombs. Some observers[who?] considered this to be an act of total war, owing to the fact that powerplants supported by the electrical grid were essential to water purification and thus the strike represented a direct attack on civilian resources. NATO claimed that the objective of their strikes was to disrupt military infrastructure and communications. ^ On the Road to Total War: The American Civil War and the German Wars of Unification, 1861–1871 (Publications of the German Historical Institute). German Historical Institute. August 22, 2002. p. 296. ISBN 0-5215-2-119X. ^ Roger Chickering; Stig Förster (2003). The shadows of total war: Europe, East Asia, and the United States, 1919–1939. Cambridge University Press. p. 8. ISBN 978-0-521-81236-8. ^ Stig Förster (2002). On the Road to Total War: The American Civil War and the German Wars of Unification, 1861–1871. Cambridge University Press. p. 550. ISBN 978-0-521-52119-2. ^ DeGroot, Gerard J. (2004). The bomb: a life (1st Harvard University Press pbk. ed.). Cambridge, Mass. : Harvard. p. 153. ISBN 0-674-01724-2. ^ Bell, David A (12 January 2007). The First Total War: Napoleon's Europe and the Birth of Warfare as We Know It (First ed.). Houghton Mifflin Harcourt. ISBN 0618349650. Retrieved 19 January 2017. ^ "China: The Battle of Tongcheng (Taiping Rebellion, 1850-1864) – Pictures From History". www.picturesfromhistory.com. Retrieved 2018-01-03. ^ a b Kuhn, Philip A. (1978). "The Taiping Rebellion". The Cambridge history of China. Twitchett, Denis Crispin, 1925-2006., Fairbank, John King, 1907-1991. Cambridge [England]: Cambridge University Press. pp. 276–7. ISBN 0521214475. OCLC 2424772. ^ "Sherman's March to the Sea – Ohio History Central". Retrieved 5 August 2015. 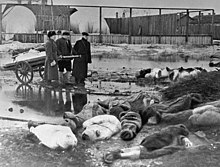 ^ "Leaders mourn Soviet wartime dead". BBC.co.uk. Retrieved 5 August 2015. ^ "The Casablanca Conference, 1943". Office of the Historian. United States Department of State. Retrieved 19 January 2017. ^ "World War II (1939-1945)". The Eleanor Roosevelt Papers Project. George Washington University. Retrieved 19 January 2017. ^ Castella, Tom de (15 February 2012). "How did we forget about mutually assured destruction?". BBC News. Retrieved 19 January 2017. ^ Gordon, Michael. "CRISIS IN THE BALKANS: THE OVERVIEW; NATO AIR ATTACKS ON POWER PLANTS PASS A THRESHOLD". nytimes.com. New York Times. Retrieved 6 December 2017.